The Dodgers Select Jordan Sheffield from Vanderbilt - Welcome to the Dodgers! Dodgers Select Louisville Catcher Will Smith - Welcome to the Dodgers! In a year where a lot of the best college catching prospects are skewed heavily in favor of offense (Miami's Zack Collins, Virginia's Matt Thaiss) or defense (Tulane's Jake Rogers), Smith is one of the better all-around backstops available. He's a quality defender who has upped his offensive game as a junior. Smith stands out most for his work behind the plate. He has solid arm strength and such a quick transfer that he consistently records pop times of 1.9 seconds or less and opponents rarely try to run on him. He's a good receiver who has more athleticism and agility than most backstops. After batting a combined .235 in his first two years at Louisville, Smith has been one of the Cardinals' most productive hitters this spring. He has a compact right-handed swing that lends itself to contact and getting on base, if not much power. He has at least average speed and can steal a base on occasion. Dodgers Pick High School Shortstop Gavin Lux - Welcome to the Blue! With the 20th overall pick in the 2016 MLB Amateur Draft the Dodgers pick Gavin Lux in the first round. He is an 18-year old shortstop from Kenosha, Wisconsin. In fact, he is the highest drafted player from the state of Wisconsin. Lux stands 6' 2", bats from the left side of the plate and throws right-handed. You can follow him on twitter here: @TheRealGavinLux. Lux won't be able to match the Draft status of his uncle Augie Schmidt, the No. 2 overall pick and the Golden Spikes Award winner in 1982 who's currently the head coach at NCAA Division III Carthage (Wis.). Nevertheless, he's a top prospect in his own right and has a chance to become the highest-drafted Wisconsin position player since the Mets popped Scott Servais in the second round 31 years ago. The second-best high school shortstop available, trailing only Puerto Rico's Delvin Perez, Lux was generating first-round buzz as the Draft approached. Because he grew up around his uncle's program, Lux has advanced instincts in all phases of the game. His tools are catching up, as he has improved his strength, swing, speed and arm in the last year. He has worked to eliminate a hitch in his left-handed stroke, which has enough bat speed and leverage to produce 15 homers per year. After previously seeming destined for second base, Lux now should be able to remain at shortstop. His arm strength and speed are at least solid -- some evaluators grade them as pluses -- and he has reliable hands. He's committed to Arizona State but figures to get drafted too early to make it to Tempe. 2016 Topps Tier One Baseball cards are now available at your local hobby shop. This is a high-end product that promises two autograph cards and a relic in each pack. There is only one pack in each box, and that'll cost you about $100. Go here for a complete checklist. There are numerous Dodgers card available, so over the next few days I hope to share many of them with you. 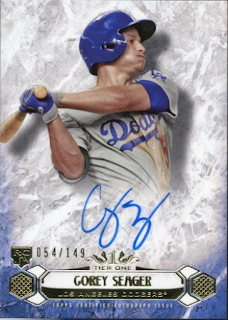 Below are the Breakout, Clear One and Dual Autograph Dodgers cards. Unfortunately, the Kenta Maeda Breakout card is only available through a redemption. On a side note, an Asian Edition version of these cards are available through GTS Distribution and it includes several exclusive parallel cards and a Mystery Redemption autograph variation card that will be numbered to 50 copies. 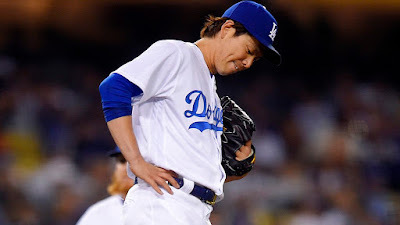 I'd put good money on Kenta Maeda being that mystery card. "The way Maeda pitched, we have to win that game," said Roberts. "I think our hitters are trying too hard." The photo above via @Dodgers on twitter. BTW, today is the first two rounds of the MLB Amateur Draft. It all begins at 4:00 PM, and the Dodgers have four picks (#20, #32, #36 & #65). Their bonus pool money is at $9,336,500. Check out Ken Gurnick's story at MLB.com about the draft and the Dodgers strategy this evening (link here). "I know everyone judges on the first five picks and they're probably not as strong as people would like," (Billy Gasparino) said. "For us in the middle portion of the first round and on, it's really strong. Player 10 to 50, we feel really good about that group. Better, I think a whole grade higher than last year in depth and talent." This Day in Dodgers History: In 1919 Dodgers starter Rube Marquard breaks his leg running the bases during the game against Cincinnati. In 1990 Eddie Murray hit a home run from both sides of the plate in the game against the Padres in San Diego. Having done this for the tenth time in his career, he ties a MLB record with Mickey Mantle.